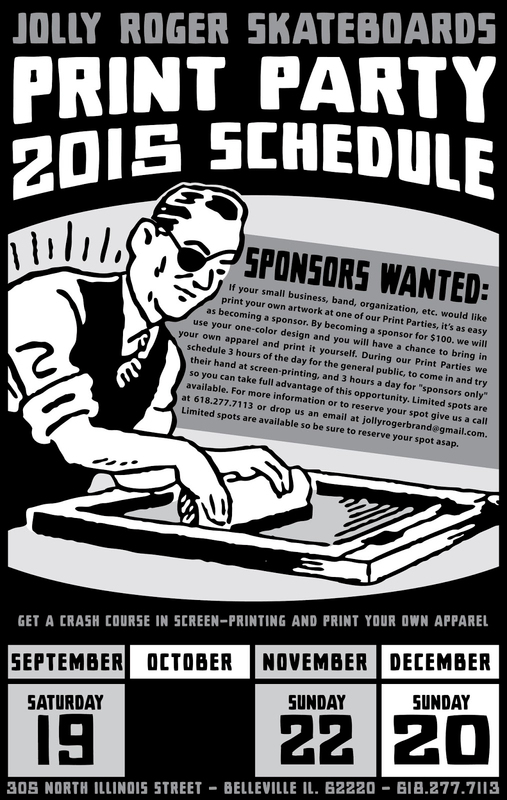 Here is the schedule for our upcoming Print Parties at the shop for the next 4 months. Our Print Parties give the general public the opportunity to get their hands dirty and print their own tees. Each Print Party allows you to print one of each of the 4 designs that will be provided by our sponsors, free of charge. Additional prints are $1. per tee to cover the cost of ink. We will have a limited quantity of blank tees on hand for $4. 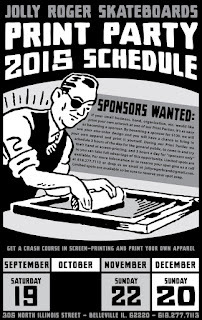 SPONSORS WANTED: If you would like to become a sponsor and have your artwork featured during one of our Print Parties we reserve your spot on a first come, first serve basis. To insure your spot we must have your artwork in the following file formats: AI, EPS, PDF, or JPG. Graphics created in Photoshop must be high resolution images (at least 300 dpi). We must also have your sponsorship payment in advance to cover the cost of ink and other materials. 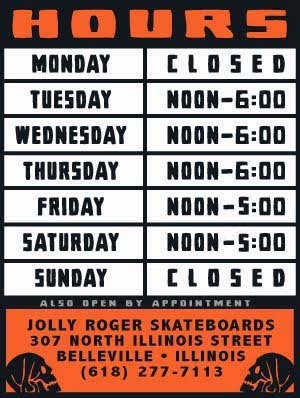 *For more information give us a call at 618.277.7113 or drop us an email at jollyrogerbrand@gmail.com.